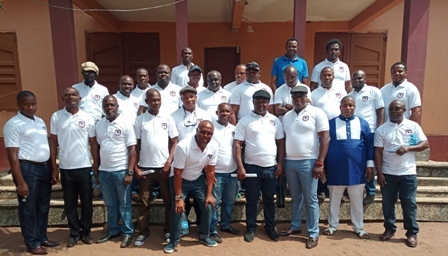 The 1991 set of Ika Grammar School Old Boys Association, at home and in the Diaspora held their Annual General Meeting (AGM) to discuss some issues that would move the association and the school to greater heights. Speaking during the enlarged meeting, the immediate past Chairman of the Old Boys Association, Mr. Lucky Monye thanked members for their unity, cooperation and understanding towards the growth of the association. Mr. Monye who was a House of Assembly Aspirant in Ika South constituency under the platform of the All Progressives Congress (APC) advised members to continue to conduct themselves and remain committed to activities and programmes that will move the association forward. Also speaking, the Principal of Ika Grammar School. Ven. Charles-Omor Okumbor congratulated the group, particularly Mr. Monye led Executive members, for their maximum cooperation. He said he has no regret serving as a Principal of the Christian school because it is a good school and one that has produced a lot of prominent Ika sons. He noted that he has been serving in the school for more than nine years and since that time, God has been so faithful. In addition, Ven. Okumbor disclosed that the school has a well equipped library, well secured Boarding House for the students and population of over three hundred and fifty students and other facilities. He concluded by encouraging the new Chairman of the association, Mr. Austin Onyero Oyo and his Executive members to remain hardworking and faithful to the group’s welfare so that they will continue to move forward. In his acceptance speech, the new Chairman, Mr. Austin Onyero Oyo, expressed gratitude to God for making his dream come true. He thanked every member of the association for finding him worthy to serve as the Chairman. He, on behalf of his Executive members, promised to carry all members along and bring development to the association and the school. Also, as part of the activities marking the annual event, a member of the Old Boys Association, Managing Director, Ambassador Pastor Godwin Osakwe donated fifty copies of computer textbooks to members of the group. He promised to do more as long as the Chairman and his Executive continue to carry members along in their discussion and plans to move the association forward.